Are you ready to lead a digital change in your school? Are your students going to help lead this change? Last year at Milan Community Schools, we embarked on the journey to empower students via a student-led tech team. One of our first steps was to travel to Madison, IN for the "Alter Ego Conference” on Saturday, April 26, 2014. It was a pivotal day for Milan’s newly established student-led Tech Team, the “Tech Tribe”. Unaware of how powerful this experience was going to be for us, we attended the conference that showcased what student digital leaders can do in a school. Classes at the conference included workshops on cyberbullying, digital identities and social media. The Alter Ego Conference empowered my students to walk away with a vision of what was possible outside the walls of Milan Community Schools by students. We are now finishing our first year of going 1:1. It hasn’t been easy, but we have accomplished a lot including creating “how-to” videos like we saw at the conference and a help desk with a site for students and teacher support. We are definitely going again this year with a purpose of expanding our vision. I am taking as many of my Student Tech Team members as I can so that they can be motivated by this experience. Are you ready to lead a digital change by empowering your students? If so, I hope to see you at the HSDL conference April 25 in Noblesville. 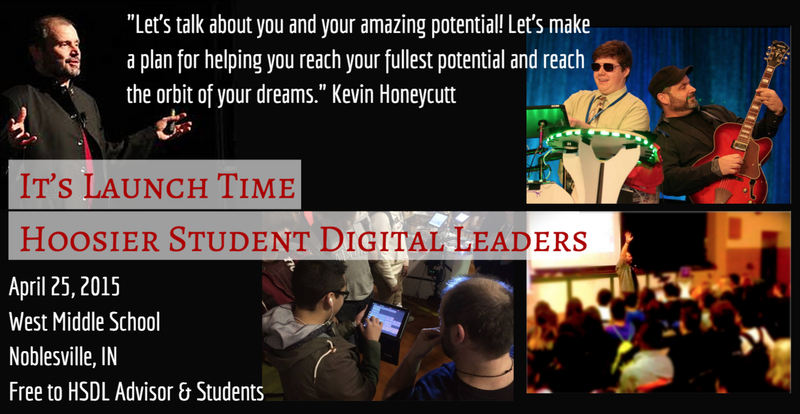 The HSDL Conference, the main event for the Hoosier Digital Student Leader program, is open to all Indiana students in grades 6-12 to attend with a district/school advisor at no cost. This event is for established groups as well as those who are in the planning stages of forming a school tech team, club or class. Get the details and registration form here.